Many people want to use their money to pursue a long list of goals: retirement, education, separate savings goals for home projects, gifts or vacation, day-to-day expenses, and the list goes on. Depending on where you keep your money, you might be able to earn some interest on it and sleep better at night knowing that it's insured. In some cases though, you might have to wait a few days to get your hands on your funds or pay a penalty if you withdraw your money before a certain time. Most people keep their money in a savings account, with their monthly expenses kept in a checking account at an online or brick-and-mortar bank. Others don't believe in banks (especially younger generations) and hold onto their money in envelopes. Meanwhile, plenty of people don't realize the growing number of options available to keep the rest of their money organized, or the purpose that different accounts may have. The following takes you through some of the most popular options when it comes to where you should keep your money so you can protect it and have it available when you need it. However, always make sure to keep a buffer in your checking account to avoid overdraft fees. For example, say you forgot you had a monthly bill being withdrawn from your account, and buying lunch results in a negative balance. You'll be hit with an overdraft fee, depending on the policies of your bank. Don't have a bank account yet, or are thinking about switching banks? Many people are unaware that there are a ton of options when it comes to which institutions you hold your money with, as brick-and-mortar banks and the "big names" are what often come to mind. There are community banks, online-only banks, and credit unions, to name a few. Within those, there might be rewards accounts with incentives, high-yield accounts, and more. With so many options, it can be difficult to choose, so here's one thing you need to keep in mind: choose the bank with the least amount of fees. You shouldn't have to pay monthly maintenance fees to a bank just to keep your money there, or ATM fees to withdraw your funds, or a fee to speak with a banker. More often than not, online-only banks, community banks, and credit unions have the least amount of fees. Online-only banks have low overhead because they don't have to pay for physical locations, and because they're accessible on the Internet, they're very conveniently open 24 hours a day. Community banks and credit unions are focused on the people they serve and are a bit more lenient with interest rates and fees than larger banks. Unfortunately, with any of the big names out there, you're going to face a slew of fees, minimum deposits and balances, and other requirements. Banking should be easy, so read the fine print first. A lot of people keep their emergency fund lumped in with their general savings, but this could be a mistake, depending on how much self-control you have. Emergency funds should only be accessed when there's an actual emergency. The problem is that everyone has a different definition of what constitutes an emergency. Most experts say that emergency funds are for things you cannot anticipate ahead of time, or for dire situations, like the loss of a job. Therefore, wanting to buy new clothes, but not having enough money in your bank account, isn't an emergency. It's not a need or essential to survival. If you can't trust yourself to leave your emergency fund alone until you actually need it, then you should open up a savings account at a different institution from your regular savings account. Why? Because the more steps you need to take to access the funds, the less likely it is for you to try and use them when you shouldn't. An option is setting up an online-only savings account. They're typically much quicker and easier to open and it doesn't require going to a branch. Plus, you won't be as tempted to physically go to the ATM to withdraw money, but you can still transfer your funds when they're needed. So, what about savings goals you have that are going to take three to five years, or more, to accomplish? You might want to open up separate sub-savings accounts for each of these. What's a sub-savings account? Some banks allow you to open up one main savings account, with "sub" accounts linked to it. So you can use your main savings account for short-term savings, and open up different sub-accounts for things like travel, a new computer, a new car, etc. It can be wise to separate your savings goals. If you have one main savings account with a total of $20,000, but you're saving for a wedding, a down payment on a car, along with a vacation, what do you do? You might find it difficult to prioritize your individual goals. Having separate accounts specifically earmarked for each goal makes it easier to tell when you've reached them, and taking the money out doesn't interfere with your other goals. So for example, divide that $20,000 up. You have $10,000 in your "wedding" account, $7,000 in your "car down payment" account, and $3,000 in your "vacation" account. Your goals are $20,000, $10,000, and $3,000 respectively. You realize you've hit your vacation savings goal, so you divert the money you were saving toward your vacation to your car down payment account and start planning your trip. If you had the original lump sum of $20,000 in your account, you might have been hesitant to withdraw any of it for your vacation since you're working on two other important goals. Many banks, especially online banks, will allow you to open an unlimited amount of sub-savings accounts. From there, you can set up automatic transfers from your checking account to each of these savings accounts. As the next step after saving for goals, these options are for those who already have a decent amount of money saved, but aren't looking to invest it for the long-term (5+ years). If you're looking for a place to park your money for a few years, money market accounts and CDs (Certificate of Deposits) may be your answer. These savings accounts typically offer slightly higher interest rates than normal savings accounts. If you choose to open a money market account or CD, there are a few things you should understand beforehand. Money market accounts work like a hybrid of checking and savings accounts, as you can write a limited amount of checks from one. Money market accounts also invest in securities, unlike regular savings accounts, which is why they can offer slightly better interest rates. CDs are different in that they have fixed maturity dates, meaning that when you open one, you'll have to keep your money in there for a specific amount of time. Thus, if you need to take the money out before the CD has matured, you will face an early withdrawal penalty. The amount of the penalty is dependent upon the terms of the CD. With that said, CDs are generally not a good idea for emergency funds because you want that money to be accessible without penalty when you need it. Both of these accounts also usually require higher opening balances than regular savings accounts. For example, you may need to have $10,000 to place into the account once it's open, whereas some savings accounts can be opened with as little as $10. No matter where you are in your career, you should make saving for retirement a priority. Setting up automatic deductions from your paycheck is one of the easiest ways to do this. If you're self-employed, look into SEP IRAs. As long as you aren't earning a large amount of income that puts you outside the IRS limits, you should be eligible to open an IRA, which is important if your employer doesn't offer a 401(k) plan. Money cannot be withdrawn from an IRA without penalty until you reach age 59 and a half, unless it's for a special circumstance, like buying your first house. You can also withdraw contributions you've made to a Roth IRA without penalty. A 401(k) plan is similar in that you'll face penalties for early withdrawals, but the good thing about a 401(k) is that your employer may offer to match your contributions up to a certain amount. 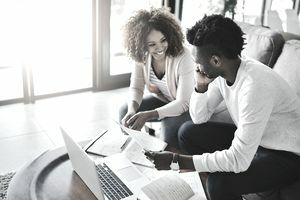 The standard financial advice says to contribute up to the match, and depending on how great a return your 401(k) produces, you may want to contribute the rest to an IRA (since you have more control and flexibility with the funds). Do you want to pay for your child's education? Then think about opening a 529 Savings Plan, as this account is specifically for saving for someone's future education. You can open it for any beneficiary - not just your child, but a grandchild, friend, or relative. If you've been saving money in a regular savings account, that might not be enough to overcome inflation. If your child is younger and still has a long way to go before college, the cost of tuition is going to rise, and you want to put your money somewhere that can keep up, and the tax benefits of a 529 are very important. 529 Plans are sponsored by individual states or state agencies and can be opened with a number of financial institutions. You'll come across two types of plans: pre-paid, and savings. Some experts recommend against pre-paid plans for a number of reasons, so make sure to do some research before deciding which is best for you. You also aren't limited to your own state's 529 Plan, so it's important to shop around and compare fees and the historic performance of different funds. Some states offer incentives, and 529 Plans also have many tax benefits.